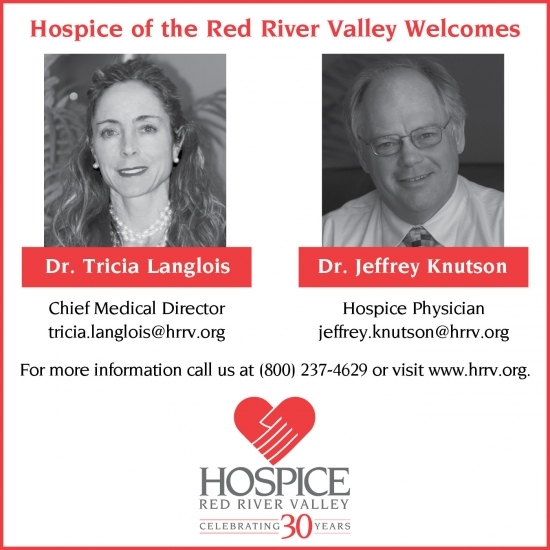 Hospice of the Red River Valley has named Tricia Langlois, M.D., M.S. chief medical director. In this role, she is responsible for the strategic leadership, vision and provision of hospice medical care to patients. Jeffrey Knutson, M.D. joins the organization as a hospice physician. In collaboration with Dr. Langlois, he ensures the delivery of patient-centered, high quality medical hospice care to patients and their families. Most recently, Dr. Langlois practiced geriatrics at Altru Health System. She received her medical degree from the University of Texas Medical Branch at Galveston. Langlois completed her residency in internal medicine and post-graduate fellowships in geriatrics and women’s health at the University of Wisconsin Hospital (Madison, Wisconsin). She also holds a master’s degree in population health from the University of Wisconsin-Madison. Dr. Knutson previously practiced cardiothoracic surgery at Essentia Health. He received his medical degree from the University of Minnesota, and completed residencies in general surgery at Saginaw Cooperative Hospitals (Saginaw, Michigan) and thoracic surgery at Case Western Reserve University (Cleveland, Ohio).